In My Utmost For His Highest, which is the bestselling devotional book of all time, Oswald Chambers speaks of the Apostle Paul's "unstoppable determination for [God's] holiness." According to Chambers, Paul's words in Philippians 1:20 could be paraphrased, "My utmost for His highest—my best for His glory." Chambers goes on to add: "Before we choose to follow God's will, a crisis must develop in our lives. This happens because we tend to be unresponsive to God's gentler nudges. He brings us to the place where He asks us to be our utmost for Him and we begin to debate. He then providentially creates a crisis where we have to decide—for or against. That moment becomes a great crossroads in our lives. If a crisis has come to you on any front, surrender your will to Jesus absolutely and irrevocably." The purpose of this little book is to bring you to a crossroads in your life. To bring you to a crisis of faith where you will decide to totally commit yourself to Jesus Christ, without reservations and with no strings attached. Until you make such a commitment to Christ, you will never know the holiness of God! This, and this alone, is the initial step on the pathway to holiness. The word holiness and the word holy appear in the Bible over 900 times. Such prevalence in Scripture assures us of the importance of this subject. Anything mentioned hundreds of times in the Bible is a fitting subject for serious study. Therefore, we embark on our study with perfect assurance that it is a worthwhile endeavor. Most people define holiness as clean living, moral straightness, ethical behavior, or sterling character. Although all of these things will be present when true holiness is found, holiness is much more than mere virtue. For instance, I may define a school bus as yellow. While yellow will be seen every time I see a school bus, there is still much more to school buses than the color yellow. Likewise, there is much more to holiness than virtuous living. The Hebrew word for "holy" in the Old Testament, as well as the Greek word in the New Testament, both mean "to be separated" or "set apart." Thus, most theologians simply define holiness as being separated from the world and set apart for God. Although this definition is certainly correct, it is far from complete. There is another aspect of holiness that is scarcely known and seldom taught; namely, that holiness means to be separated from the profane or ordinary and set apart as sacred or peculiar. Let's take a closer look at both sides of holiness. In ancient times, kings owned everything in their realms; consequently, they found little satisfaction in the things they possessed. For this reason, each king kept a treasure chest filled with his most prized possessions. It was these peculiar treasures that the king most delighted in. God, like ancient kings, owns everything in His realm, which encompasses the whole earth, as well as everything and everyone within it.1 Therefore, He has set aside for Himself some prized possessions. These peculiar treasures are holy things. They are God's prized possessions in which He most delights. Some of the things the Bible calls holy are: 1. The Sabbath (Exodus 35:2) 2. The Tabernacle (Hebrews 9:2-3) 3. The Tithe (Leviticus 27:30) 4. The Temple (Psalm 5:7), and 5. The City of Jerusalem (Revelation 11:12). Obviously, none of these are holy because of their impeccable conduct. Instead, their holiness is a matter of them being separated and set apart for God. Of all of God's peculiar possessions His most prized is His people. According to Malachi 3:16-17, God is recording the names of all who fear Him in "a book of remembrance" so that they can "make up His jewels" in eternity. It is God's separating and setting us apart for Himself as His eternal jewels that makes us holy. In the Old Testament, God's most prized possession was His chosen people. God's chosen people were physical Israel, the natural seed of Abraham. Today, God's most prized possession is still His chosen people. However, the chosen people of God today are spiritual Israel—the church—the supernatural seed of Abraham.2 This is why the Apostle Paul, in Ephesians 1:18, speaks of "the saints" as the "riches of the glory of Christ's inheritance." Many mistakenly interpret Paul's teaching in Ephesians 1:18 as the rich inheritance the saints will receive from Christ. Yet, this is clearly not the case. Instead, Paul is empathetically stating in this verse that "the saints" are the riches of Christ's glorious inheritance. In Ephesians 1:10, Paul teaches that "all things in heaven and on earth" are coming to Christ. Since all things are coming to Christ, which part of His inheritance will He most delight in? According to Paul, it will be "the riches of the glory of His inheritance in the saints." The Greek word for "saints" literally means "holy ones." The saints are holy because they are separated and set apart as the riches of Christ's glorious inheritance. This explains why Christians are figuratively spoken of in the New Testament as: 1. "A holy temple" (1 Corinthians 3:17) 2. "A holy priesthood" (1 Peter 2:5), and 3. "A holy nation" (1 Peter 2:9). It also explains why Paul refers to the church in Ephesians 2:21 as "a holy temple in the Lord." The fact that Christ prizes us as His riches is made sure by the great price he paid for us. Two thousand years ago, Christ purchased us at the price of His own life. A quick glance at Calvary should be enough to convince us all that we are Christ's peculiar, treasured, eternal, and holy possession. Holiness may best be defined as "otherness." Its essence is illustrated in the expression: "Now that's another thing all together." To be holy means to be "other." It means to be transcendent or incomparable with other things. Holy things are peculiar, not common. They are unique, not ordinary. God is holy. He is called "Holy" in Isaiah 57:15, the "Holy One" in Isaiah 43:15, and "the Holy One of Israel" in Psalm 89:18. God is holy because He is "other." He is transcendent and incomparable with other things. There is absolutely nothing comparable with God. Jesus Christ, God's Son, is also holy. He is called God's "holy child" in Acts 4:30, "Holy One" in Acts 3:14, and the "Holy One of God" in Mark 1:24. Christ is holy because He is "other." He is transcendent and incomparable with anyone else. There is absolutely no one like Jesus! Like God and His Son, God's people are also suppose to be holy. Just as there is nothing like God and no one like Christ, there should be no people on earth like God's people. We, like our Lord, should be unique and peculiar in this world (Titus 2:14; 1 Peter 2:9). According to 1 Peter 1:15-16, Christians are to be holy for two reasons. First, we should be holy because of the character of God. Since God "is holy" His people should be holy. Second, we should be holy because of the command of God. We should be holy "because it is written, Be ye holy; for I am holy." God commands our holiness. Theologians long ago referred to the Christian's holiness as the "numinous." Numinous is a Latin word that means "something supernatural or other-worldly; something inexplicable." It is that mysterious "otherness" of God that should be obvious among God's people. The Apostle Paul refers to it in 1 Corinthians 14:24-25. Here, Paul tells how unbelievers coming into our Christian assemblies should "fall down on their faces, worship God, and report that God is in us of a truth." This mysterious "otherness" of God was possessed by Moses when he came down from Mount Sinai.3 After spending forty days and nights in the presence of God, Moses descended Sinai with his face aglow. Unbeknownst to him, but obvious to others, Moses' countenance radiated with God's mysterious "otherness." The Bible says, "And there arose not a prophet since in Israel like unto Moses, whom the Lord knew face to face. "4 When God's Shekinah Glory fell upon the Israelite camp all Israel arose and stood in the entrances of their tents. Moses, however, entered into God's glory and spoke with Him face to face in the Tabernacle's Most Holy Place. It was this personal intimacy with God that caused Moses' face to shine. In Moses' day, shining faces were hard to find. In fact, his was the only one around. The rest of God's people had settled for second-hand religion. In Exodus 20:19, Israel made the following request of Moses, "Speak thou with us, and we will hear; but let not God speak with us, lest we die." Having been shaken by God's awesome descent upon Sinai, the people requested that they never again experience the presence of God personally. Instead, they asked that Moses alone meet personally with God. Afterward, he could relay God's Word to them. They would be more than willing to do whatever Moses said, just as long as they no longer had to experience the presence of God for themselves. Shining faces are as scarce today as they were in Moses' day. Now, just like then, the people of God are satisfied with second-hand religion. Most Christians today are content having God's Word relayed to them through Christian speakers or authors. What they don't want is to hear God for themselves or to personally experience His presence. They prefer a good sermon or a good book to a any individual encounter or intimate experience with God. This mysterious "otherness" of God was also possessed by the infant church.5 After the believers were endued with power from on High at Pentecost, Christ's miraculous power went on exhibition in His church. As a result, the Christians were so magnified among the people that no one dared to join them, but everyone was in awe of them. It became obvious to all lacking in peculiarity [holiness] that they were unfit to keep company with God's peculiar [holy] people. Unfortunately, God's mysterious "otherness" has all but forsaken the earth today. The question is: "Why?" Why is today's church filled with second-hand religion instead of shining faces? Why are today's Christians maligned instead of magnified? Could today's conspicuous absence of God's mysterious "otherness" be a mere consequence of the diminishing of God in our minds? No one can deny that our fallen world is constantly reducing God to our terms. We are always reducing the sacred to the profane, even to the degree where nothing is sacred anymore. A good example of our reducing the sacred to the profane is the once popular television show Touched By An Angel. According to the Bible, angels are holy.6 In 2 Kings 19:35, one angel puts 185,000 Assyrian soldiers to death in a single night. Another angel, in Revelation 18:1, illuminates the whole earth with the brilliance of his glory. These Biblical depictions of angels are greatly diminished, however, by the cupid-doll versions that were viewed by millions of Americans on Touched By An Angel. No longer does the thought of angels conjure up in our minds Biblical scenes of heavenly visitors. Instead, when many Americans think of angles today they think of actresses Della Reese and Roma Downey. Did you know that there was once a code in Hollywood that forbid the sacred from being depicted upon the silver screen? The idea behind the prohibition was that any attempt to depict the sacred would miserably fail, both profaning it and diminishing it in the minds of moviegoers. How far Hollywood—today's purveyors of profanity—has fallen. Not only does the entertainment industry today reduce the sacred to the profane with liberality, but they poke fun at it to boot. Our precious Lord is blasphemed daily on theater and television screens all across America today. We are all familiar with the Second Commandment: "Thou shalt not make unto thee any graven image, or any likeness of any thing that is in heaven above, or that is in the earth beneath, or that is in the water under the earth. Thou shalt not bow down thyself to them, nor serve them: for I the LORD thy God am a jealous God, visiting the iniquity of the fathers upon the children unto the third and fourth generation of them that hate me. "7 Obviously, this commandment is a prohibition against idolatry. Yet, it is more than this. It is also a prohibition against reducing the sacred to the profane. It forbids us from reducing God to our terms. Interestingly, the only commandment that God reemphasizes in Exodus 20 is the Second Commandment.8 Immediately after repeating His prohibition against making images and idols, God instructs Moses in the making of altars.9 Altars, unlike images and idols, were permissible. They served a useful purpose. It was upon them that the people of God offered their sacrifices and offerings. Still, in spite of the necessity of altars, they were to be kept simple and plain. They were to be built without steps and only of earth or uncut stones. Why this prohibition against the extravagance and exaltation of altars? Was it not because an extravagant and exalted altar would divert the attention of the worshipper from God to the altar itself? In doing so the sacred would be reduced to the profane and the measure of worship would become the adornment and height of one's altar. Is this not exactly where we are in today's church? Have we not reduced the sacred to the profane? Do we not measure our worship today by the size of our worship centers, the notoriety of our preachers, the theatrical abilities of our drama teams, the sensationalism of our multi-media presentations, and the repertoire of our musicians? When we believe God is more likely to speak to us through a famous televangelist than through our local church pastor, we have reduced the sacred to the profane. We have gotten our eyes off God and onto preachers. Likewise, when we believe God is more likely to show up in a large multi-million dollar sanctuary than in a small storefront or country church, we have reduced the sacred to the profane. We have gotten our eyes of God and onto the size of our church buildings and congregations. True worship can only take place when our eyes are on God alone. It only happens in the presence of God. It occurs in those rare moments when we find ourselves mysteriously wafted into God's presence. Contrary to popular opinion, worship is not the chill that runs up and down your spine when the church soprano hits the high note. It is not the tear that falls from your eye when the drama team performs an emotional skit. It is not the feelings induced from the repetition of our favorite praise chorus. Nor is it the collective "ah" coaxed from the congregation by sensational special effects. Instead, worship is the natural and inevitable result of escaping the profane and finding oneself in the present of the sacred. In the presence of the sacred worship is spontaneous. It requires no inducement. No one in the Bible had to be induced to worship when they found themselves in the presence of God. Neither were those convinced of Christ's claims coaxed to bow down before Him. It was just the natural thing to do. If worship is the chief activity of Heaven, as well as the chief end of man, then why is it practiced so little here on earth? Is it not because our fallen world is a profane place where the sacred is mostly obscured and more and more diminished? As a result, true worship is rare in our world today and true holiness has all but forsaken it. Most Christians view the pursuit of holiness as a matter of gritted teeth and clinched fists. In other words, the secret to becoming holy is trying harder. To them the pathway to holiness is paved with their best efforts at doing right and resisting wrong. The harder they try the holier they will become. The above and most prevalent present-day notion about holiness is a far cry from the Scripture's teaching on this important subject. According to the Scripture, holiness is not something we must try to procure, but something we already possess. Having been separated from the world by God and set apart for Christ, you and I are already holy. This is known as positional holiness; holiness that is ours because of our position in Christ. It has nothing to do with anything we do, but everything to do with what Christ has done for us. It is not ours because we have earned it from God. Instead, it is ours because of God's gracious election of us. 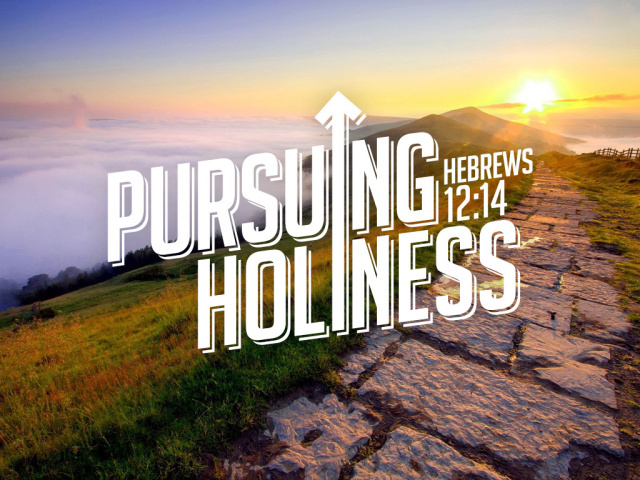 The pursuit of holiness commences with your commitment to Jesus Christ. Until you are His, you have no hope of holiness yourself. Afterward, you may continue down the path of holiness by cultivating a personal relationship with God. Your progress in the pursuit of holiness will be in direct proportion to the amount of time you spend in God's presence. The more time you spend in God's presence, the more prevalent God's power will become in your life and the more and more apparent your holiness will become to to others. You have the author's permission to print and freely distribute to others this entire manuscript or any portion thereof. If you would like to help us continue to offer complimentary resources, like The Pursuit of Holiness, you can make a tax-deductible donation to "Time For Truth Ministries." All contributions should be mailed to: Time For Truth, P. O. Box 811, Townsend, TN 37882.